We all love a good joke in Swindon, and the BBC's BAFTA winning comedy series 'The Office' is certainly full of them. Fifteen years on from the first episode we still find it hilarious watching David Brent in action - especially his introduction of the 'The Swindon lot' and his ignorance of our sponsors Arkell's Brewery! And with news that the Brentmeister is coming back to our screens for a one-off special, what better reason to sit back and enjoy taking the p*ss out of Swindon at its best - and totally backfiring! 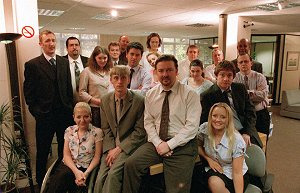 If you haven't seen the series, The Office is a fictional programme (filmed like a docudrama with no canned laughter) based on the petty goings-ons of loathsome boss, David Brent (played by Ricky Gervais), and the staff of the Slough branch of Wernham Hogg paper merchants. The comedy evolves around David’s deep rooted need to be popular amongst his colleagues and his inane sense of humour - especially since the company's sister office in Swindon has been forced to close and their staff moved to Slough. "I heard they dropped an atomic bomb on Swindon?..." "......and did about £15 worth of damage!" And after failing to impress, Brent is then forced by his new boss (from Swindon) to apologise to all his staff after cracking a couple of completely outrageous remarks about a new black employee, and a wheel-chair bound new recruit, also from Swindon. And in the second programme, first broadcast on 7th October 2002, Brent invites the new Swindon 'lot' to the pub in a team-building exercise designed to improve office harmony. Another mistake! "What is the main brewery in Swindon?....." 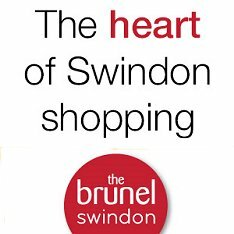 Which as any Swindonian would know, it is not! It is, of course, Arkell's Brewery! And when George Arkell heard about the episode he took the opportunity to send Ricky Gervais and 'The Office' production team a crate of Arkell's best 3Bs bitter to remind them! All-in-all, the programme is hugely entertaining, although it makes most people squirm rather than laugh outload, and is hugely popular amongst Swindon's large number of office workers who can all too closely identify with the series observational look at office life. As David Brent would probably say: "If you can't laugh at yourself, who can you laugh at - not me, of course!" Special thanks to the Picture Dept. of the BBC who kindly supplied the images for this story. All images are strictly copyright BBC and must not be reproduced without their written permission.